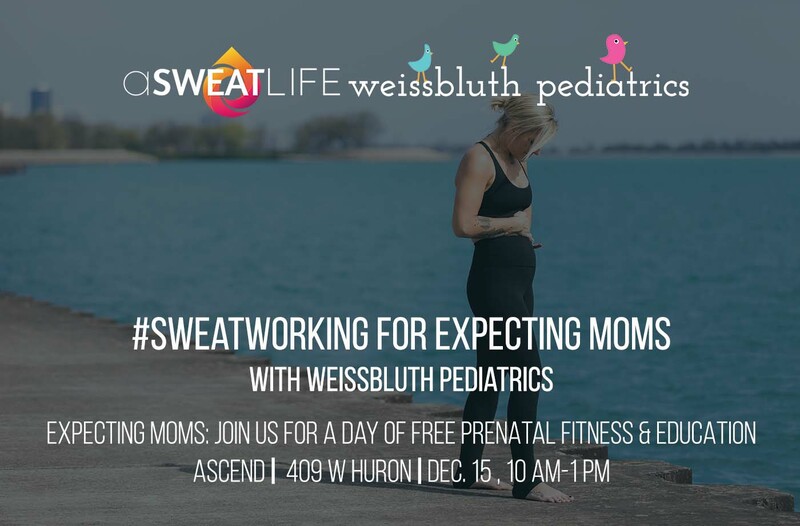 Weissbluth Pediatrics and aSweatLife are teaming up to bring new moms-to-be the very best in prenatal fitness and education on Saturday, December 15th at Ascend. At aSweatLife, we believe everything is better with friends and that fitness can be a catalyst for living your best life and Weissbluth Pediatrics is committed to expectant moms – from bump to birth and far beyond – with free prenatal education and community events that best prepare moms-to-be. It was a natural fit for Weissbluth Pediatrics and aSweatLife to launch a prenatal event bringing together expectant moms to experience and learn about prenatal fitness and newborns while meeting others in the same stage of life. On Saturday, December 15, at Ascend, expecting mothers will experience a day of prenatal fitness built just for them. Try two different types of workouts, hear from Dr. Weissbluth on preparing for baby sleep / newborn-related topics, sign-up for a one-on-one prenatal appointment with one of Weissbluth’s Pediatricians AND check out different products and services! We will kick things off at 10:00 am when you’ll take on a prenatal strength class led by Kate Lamere or a yogalates class led by Jacquelyn Brennan. Kate is a Barry’s Bootcamp and Nike trainer and she is a new mom herself. Jacquelyn is the co-founder and owner of Pilates and Coffee where she teaches and runs pre/postnatal classes. After attendees have experienced both pregnancy-safe workouts, Dr. Weissbluth will lead a workshop, “Prenatal Education: Preparing You and Your Baby for Great Sleep” and answer any questions attendees have on newborn-related topics. Attendees will have a chance to pre-register for 1-1 appointments with Weissbluth Pediatricians from any of their three locations (Northwestern/Streeterville, South Loop and Bucktown – coming soon!) that will be held in private treatments rooms, giving you the chance to ask any additional questions you might have in a more personal setting. There will also be pre-registration available for smaller group sessions with Rachelle Mallik, MA, RDN, LDN, owner of The Food Therapist, a private practice specializing in reproductive nutrition for fertility, prenatal, postpartum and breastfeeding wellness. Finally, partner brands will be setting up experiences complete with snacks, services and baby-related accessories! How to register: Get your tickets to the event here. You’ll also be able to register for 1-on-1 sessions with Weissbluth pediatricians as well as small group sessions with Rachelle Mallik. Marie experienced the importance of whole health at an early age and knew she wanted to help others adopt health as lifestyle. She moved to Chicago in 2013 after graduating from the University of Michigan (GO BLUE) with a BA in Political Science and spending 2 years as a consultant for Epic, an electronic medical record company based in Wisconsin. She spent the next few years as a project manager at Rush while getting her Master’s in Health Administration from Rush University. Her passion has always been health and wellness and after 7 years in sick care, it was time to make the move. She started teaching at Studio Lagree in early 2017, spent a few months in Aspen helping Outdoor Voices open the shop there, and joined aSweatLife in Summer of 2018 as Director of Partnerships. She loves anything outdoors, especially if it is dog friendly so her Golden Retriever, Finn, can join!